deSIGNery’s brushed chrome stickers and gold polyester decals are a great way to catch the eye of just about anyone. Our chrome and gold decals are made of the highest quality materials and are guaranteed to last. Gold polyester has limited resistance to sunlight and will fade to silver. For more details contact your customer service representative at deSIGNery Signs. Check out our Spring Sale for savings on Custom Gold & Chrome Decals and Brushed Chrome Stickers in the following link. 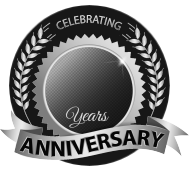 BBB Member since 2004 with a proven record of complaint free customer satisfaction on items like Custom Gold & Chrome Decals and Brushed Chrome Stickers. Click on the BBB logo above to check our record or leave a customer review. For added protection from abrasion, solvents, and scuffing. 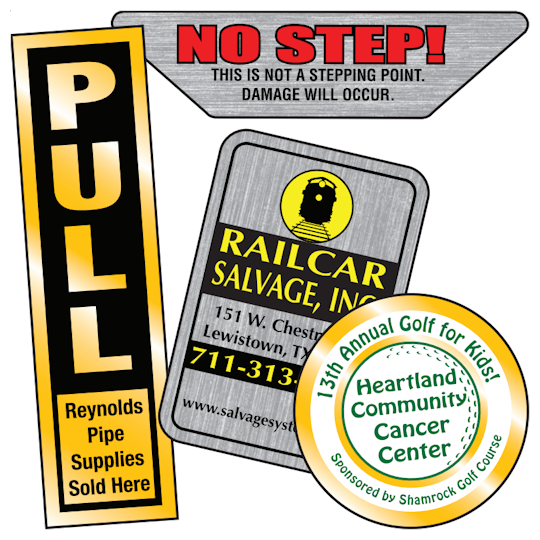 check out our pricing on laminated brushed chrome and gold polyester decals and stickers. Mirror-finish Gold Polyester or Brushed-finish Chrome Polyester is normally supplied with permanent, pressure-sensitive, acrylic adhesive. On custom decals and stickers larger than 1" x 1", the backing will be split for easier application. Our chrome and gold stickers have the ability of giving your company a professional impression to your customers. These brushed chrome stickers and decals are great for plumbing companies, railway systems, computer companies, appliance services and any company that wants to leave a lasting impression on their customers. The chrome and gold decals are supplied with permanent, pressure-sensitive adhesive, and most will also have a split backing for an easy application. They will adhere to just about any surface including glass, plastic, paper, electronics, and house hold appliances. Like most of our products, these brushed chrome stickers are able to be completely customized by you. They can include important information for your customers such as your company information, emergency phone numbers, and safety precautions. deSIGNery offers great products and we make it easy for you to order your custom decals, providing a hassle free process and saving you time and money. All of our products are competitively priced and we guarantee only the best. Visit our Contact Us page today and request a free quote using our convenient quote form. We even go as far as offering FREE samples to our customers so you know exactly what it is we are selling you. Request a free sample of our custom gold polyester decals today and let us help get your order going today!